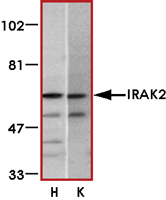 Sample Data :Western blot analysis of IRAK2 in HeLa (H) and K562 (K) whole cell lysate with IRAK2 antibody (C2) at 2 ug/ml. 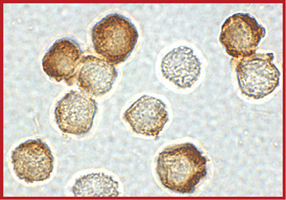 Sample Data :Immunocytochemical staining of HeLa cells using IRAK2 antibody at 2 ug/ml. Scientific Background :Interleukin-1 receptor-associated kinase 2 (IRAK2) is important downstream signaling components of Toll-like receptors (TLRs) (1). IRAKs were first described as signal transducers for IL-1 and later have been implicated in signal transduction of other members of the Toll/IL-1 receptor family. The interleukin-1 receptor (IL-1R) signaling pathway leads to NFkB activation in mammals. To date, four mammalian IRAKs have been identified (IRAK-1, IRAK-2, IRAK-4, and IRAK-M) (2). It is believed that IRAK-2 could be an additional therapeutic target for inhibiting IL-1-induced inflammation.